Terry graduated from Lincoln Institute (La Trobe University) in 1986 and promptly departed for Europe where he began working with the Performing Arts, looking after dancers, musicians and singers. Returning to Australia, in more than thirty years as a Sports Physiotherapist, Terry has continued to work with a vast array of athletes, dancers and musicians. He has been a consultant at the Australian Institute of Sport, Canberra and been appointed to the medical teams of many national and international sporting events including Olympic and Commonwealth Games and Netball World Championships. In recognition of his service, Terry was made a Fellow of the Australian Sports Medicine Federation in 2005. 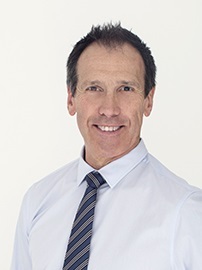 He has served numerous terms on both the Victorian and National Boards of Sports Medicine Australia (SMA), Australia’s national umbrella body for sports medicine and sports science. Outside Physiotherapy, Terry is a CFA Volunteer Firefighter and Aircraft Officer, and enjoys a large number of outdoor activities, including landscape photography, cycling, rock climbing, skiing and bushwalking. He and his wife Jo live in the Dandenong Ranges and have three adult children.